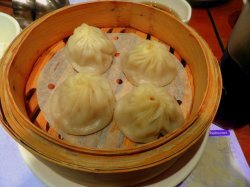 just had a 4pax family dinner at crystal jade lamian xiaolongbao at hollandv. it was 630pm but i managed to get parking across the road at warna road side carpark next to the mrt exit. #1 here was among the best i had tried. a friend commented on facebook that the skin look thick on the photo. but actually the skin was quite thin, and the soup in the dumpling was very tasty. the total for the 6 dishes plus 3 barley drinks for 4pax came to S$68, quite ok for a simple family dinner. 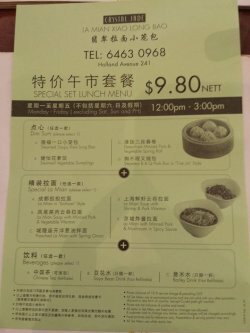 had a 20mins lunch at Crystal Jade Lamian Xiaolongbao HollandV on 13.3.2014. they start serving the S$9.80nett (i think used to be S$8.80) only at 12pm! 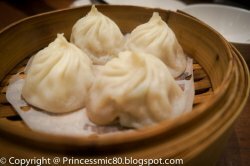 i had great dishes here at crystal jade lamian xiaolongbao @ hollandv on 11.8.2013 & also at the taka branch with my G8 friends on 2.9.2013. i had not yet tried the quick lunch set so today is the day. it’s not quite the meal for me though. i don’t really need to eat lunch and if i do the S$18pax ++ type 2-course lunch at reddot brewhouse on 12.3.2014 would be more worth the while. Was here in the afternoon so there was no xiao long bao buffet. We had the ale carte dishes instead. the dan dan mian is average, doesn't taste awful but nothing fantastic about it too. The noodles can be more chewy though. 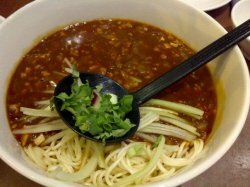 The si chuan noodles was not bad according to my friend. The sauce is very flavorful that make the make the entire dish very appetizing. Both dishes that we ordered had a big portion. Overall, we feel that the ale carte dishes are pretty average here. Will only be back for the Xiao Long Bao buffet! You get to enjoy free flow of xiao long bao and their steamboat quality is awesome too. We ordered chicken and ma la for our soup base, there a wide range of ingredients for you to choose such as fishball, meatball, golden mushroom, cabbage, crab meet, prawns, pork slices etc. However, sad to say they don't have my favorite hotdog. Anyway, their pork slices are a must try! 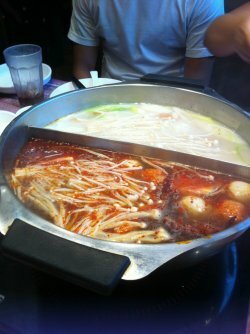 very delicious especially in the ma la soup base. Overall, i will definitely be back again. 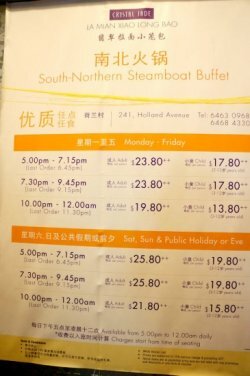 The price of the buffet gets cheaper if you go later in the night (say 10pm). Also remember to call for reservation if you don't want to wait for too long for a seat. 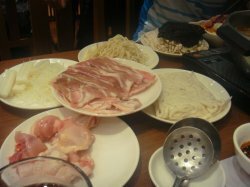 2nd time this month to eat steamboat, but to me eating steamboat is never a boring thing cause it’s always eaten with a group of friends with many varieties of food. 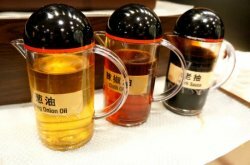 We went to Crystal Jade at Holland Village. Made a reservation 5 days ago as this place is always pack and rarely someone will get a seat walking in to the restaurant without making a reservation. 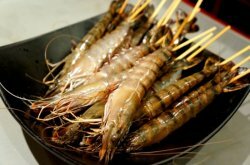 Their steamboat buffet is really value for money, there’s a ONE TIME ONLY fresh live prawn given to every table. So don’t be shocked if you ate it all and expected another round. 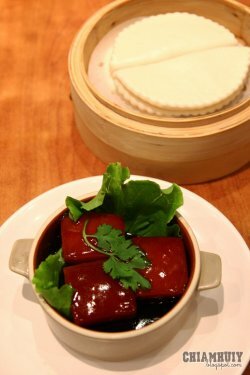 All their ingredients are fresh and buffet also include assorted dim sums and desserts. My tip is to order the Xiao Long Bao first when you are seated as there’s a waiting time for it. 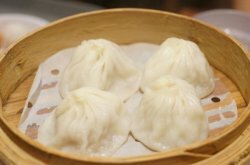 The Xiao Long Bao is the star of the meal as it's well made by skillful chefs, careful when you bite as hot soup within will spurt out. Taste wise for the rest of food there are no issues nor much to say when it comes to food that’s cooked DIY, only service issues because this place gets crazy crowded and the Xiao Long Bao can take up to half and hour of waiting time because it's so high in demand. 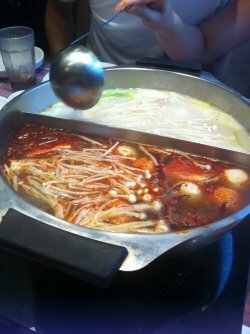 I was craving for some la mian and Crystal Jade La Mian @ Holland Village came to my mind so I decided to try it. The sauce itself was pretty good, as it was sweet and sour at the same time and came with a generous serving of vegetables. 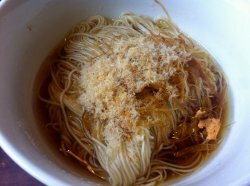 The noodles itself was quite springy and done pretty well although one may complain some were a tad too thick. One would have to mix up the noodles with the sauce properly for a good and relatively affordable meal at around $12. 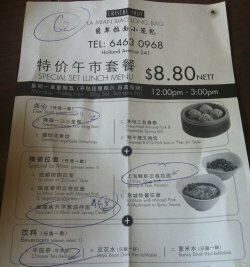 Weekday set lunch at $8.80 nett - Thumbs up! 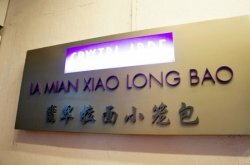 Passing by the crystal jade la mian xiao long bao outlet at holland village, we were attracted by the advertisement for their weekday set lunch and decided to try it. 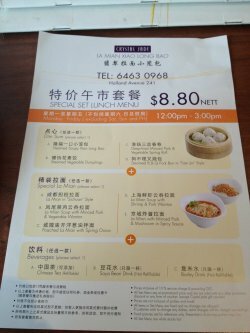 One dim sum + la mian + drink for only $8.80 nett. 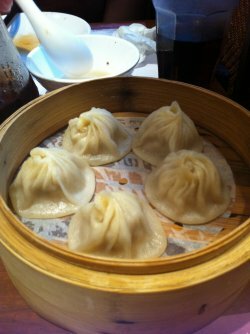 It's highly recommended that you choose the xiao long bao for the dim sum. The skin was thin and yet did not break when you lift up the xiao long bao. The soup within and the minced pork was very tasty as well. 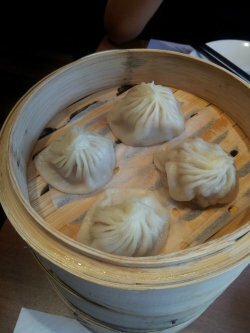 A strong contender to Din Tai Fung's famed xiao long bao. The bowl of la mian was slightly smaller than the usual bowl, but still plenty for me, especially considering there's the dim sum and drink in the set as well. 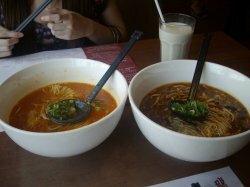 In fact, I'm glad they gave a smaller serving for the la mian actually so that I can finish all my food. The sauce was not bad, although I would have liked it if it's spicier. The noodles were good in texture and went very well with the sauce. I thoroughly enjoyed my meal here which was really worth the buck! Me and my group of 20 friends had the famous holland village's xiao long bao buffet and it was amazing. because of the size of our group, we had to split into 2 tables but the xiao long baos were so god-like that we all ate at least 5 baskets. 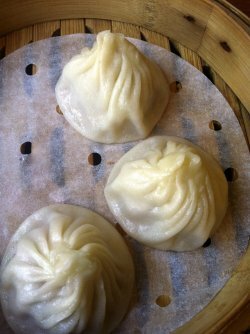 The xiao long baos were served piping hot so each of them is like a little wonder in your mouth. It is so juicy!!! 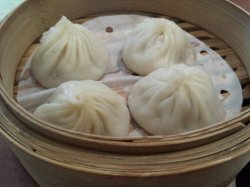 The ambience is good but the food comes a little slowly during peak hours so order in bulk!The price is great- under $30 for unlimited xiao long baos - i am not a steamboat fan so i focused more on xiao ong baos. I would recommend this to all. Enjoy! 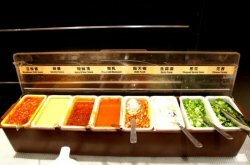 I'm sure many of us have patronized, or at least heard about the large food chain of Chinese Culinary Restaurants - Crystal Jade. 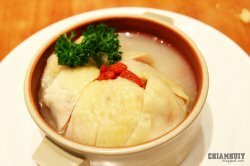 Not only does Crystal Jade serve comforting food that warms your stomach, it serves exquisite chinese culinary that you probably could find elsewhere, but fetching at an even higher price. And all because of this, Crystal Jade managed to be one of the great places to visit for family lunch/dinner, not forgetting to mention - their fantastic Xiao Long Bao and La Mian. 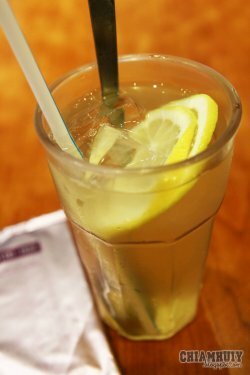 I started off my dinner with a simple Honey Lemon Drink (Iced). 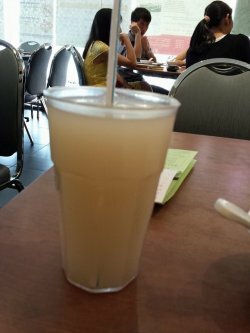 If restaurants always serve you diluted honey lemon drink and you feel cheated for paying for such a quality, fret no more because the honey lemon here is really sweet and soothing for the throat. It fetches a good balance between the sweetness from the honey and the sourness from the lemon. 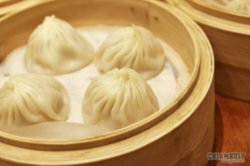 It's no secret that the Steamed Soupy Xiao Long Bao receives tremendous popularity when the number of buns sold per outlet is 6000-7000. The thickness of the skin has been kept ideal - not too thin such that is breaks when lifted up, and not too thick such that the flour skin would cover the taste of the soup and meat. 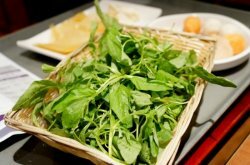 To enhance the taste, you may want to dip it with some vinegar and sliced ginger. 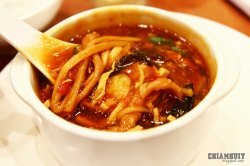 Everytime I visit a Chinese restaurant, I would order their Sichuan Spicy and Sour soup because I love the combination of spicy and sour. 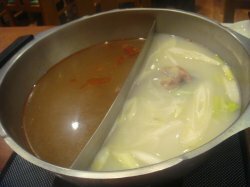 Do not belittle this humble looking bowl of soup here at Crystal Jade because it comes with generous amount of ingredients, as shown in the photo. 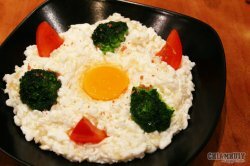 Ingredients include sliced bamboo shoots, mushrooms and even strands of egg white. Give yourself a pamper and enjoy this dish filled with wellness and nutrients that are good for your health. 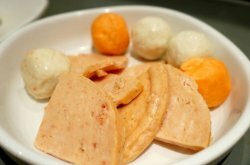 Chinese ingredients like Wolfberries (枸杞子) and Chinese Yam (淮山Huai Shan) are used to create this dish with authentic flavour. I personally like the slightly chilled chicken texture (note, it's not served hot!) dipped in a pool of Chinese Wine. Not only does the chicken meat taste extremely succulent and tender, every bite reveals the chicken wine that was successfully absorbed into the meat. Make a sinful choice and it definitely has to be the Braised pork belly. I know health conscious people will be very wary about having this dish but what's wrong with taking a sinful indulgence only once in a blue moon? To reduce the overwhelming greasiness from the layered fats, you may like to complement the pork belly with the plain pancakes. 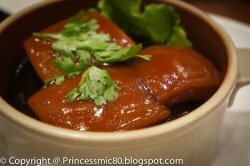 If you understand mandarin, you may thought this dish has got to do with crab meat (赛螃蟹); but sorry that's not the case! 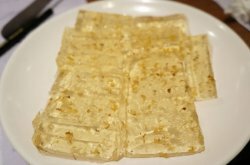 This dish is actually a combination of egg white, fish meat and a little trace of dried scallop to resemble crab meat texture. As I bring a mouthful into my mouth, I could taste trends of white fish mixed within fresh velvety egg whites. 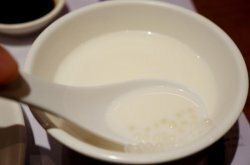 It was indeed a unique dish that I've never came across before. We ended off our exciting gastronomical meal with a cooling Mango Pudding that comes with HK condensed milk, added with your own discretion. 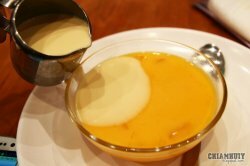 Some fun facts here: A bowl of mango pudding is actually made of a whole mange, half used to make the mango juice while the other half remains as the mango cubes aggregated into the mango pudding. It gets really crowded during dinner time so make sure you make your reservation to prevent disappointment! Cravings for Xiao Long Bao & La mian at night and afraid that all restaurants has taken all their last order? 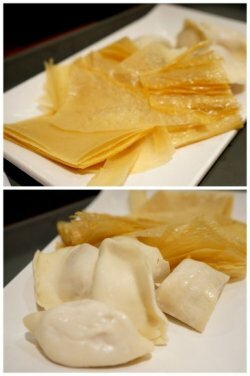 fear not cos you still can get xiao long bao at Holland V's Crystal Jade Shanghainese Restaurant. 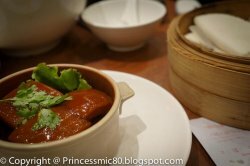 This time we tried their Dong Po Rou ( fatty meat ) with mantou. and is really good. 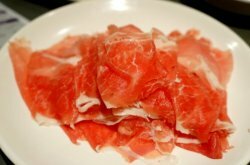 the meat is very well cooked and soft. It melts in your mouth. 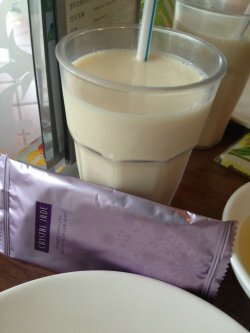 Especially the "collagen" on the skin, it is so rich that you can feel it! the mantou is super thin so you will get to enjoy the meat more than the mantou. we will be definitely back for more late night food Crystal Jade @ Holland V! The best Xiao long bao ever! 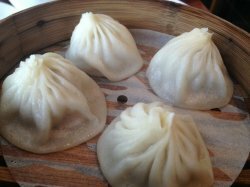 If you are looking for juicy Xiao long Bao, must go to Crystal jade! My all time favorite! 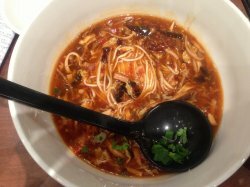 The la main always come in a huge portion, and if you are a small eater, two person can actually share a bowl of la mian. The spicy cucumber did a great start as an appetizer! Cucumber was very crunchy, and the chili oil blend well with it and was really refreshing. 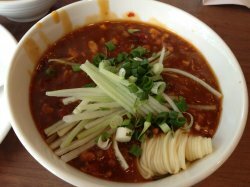 I ordered the spicy and sour thick soup la mian. And guess what, the soup was really thick, more like gravy. There were a lot of dried chili flakes in it, but taste was okay, not too spicy. 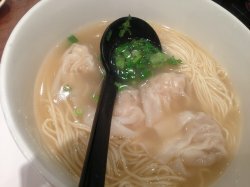 My friend ordered the la mian soup with shrimp wanton! The wanton was big and shrimp were very fresh! And we ordered 2 set of the famous Xiao Long Bao,total 8 pieces! 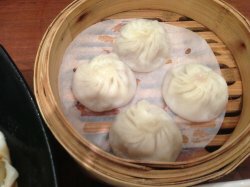 The Xiao long Bao were very juicy, and were bigger in size compare to the one in Ding Tai Fung! Dipping the Xiao Long Bao in the ginger and vinegar was the way to eat it! But beware of your bite while eating Xiao long Bao, as the soup will gush out and might burn your tongue ! Then, we ordered another 8 pieces of pork dumplings with spicy chili sauce. Dumplings skin was just nice, soft and smooth! 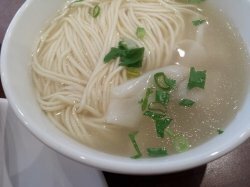 It was a perfect la mian dinner!